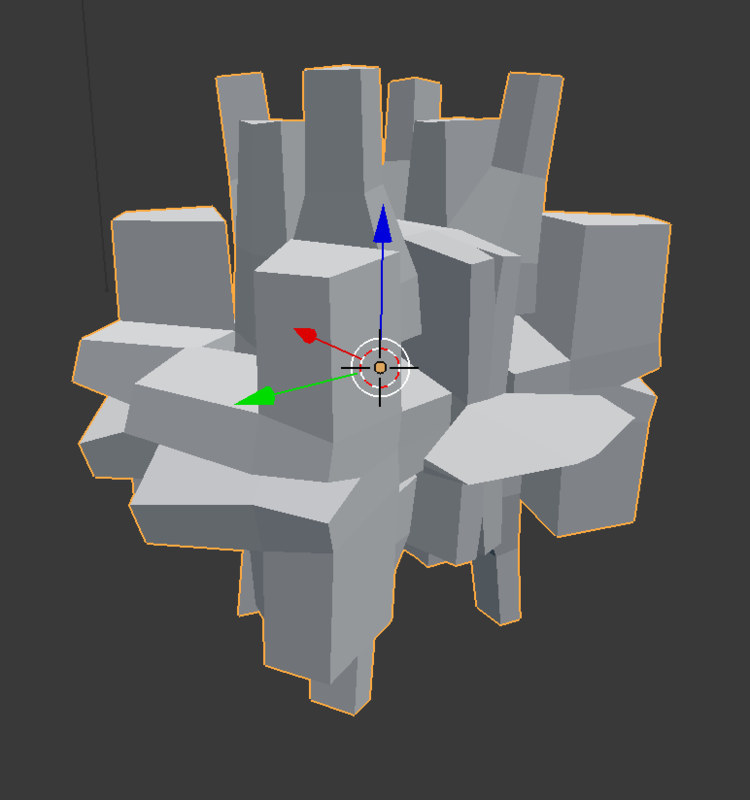 Create base meshes for further editing such as spaceships, game assets, and objects I haven't even thought of. The shapes are created by specifying a random number and then changing a range of length, scale and rotation parameters of the resulting extrusions. By default, the add-on will work to ensure that the faces of the shape won't overlap. 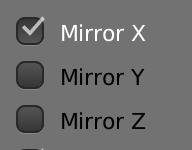 You can choose whether the shape is mirrored in the X, Y and Z axis by a mirror modifier (or not at all). The add-on provides the option to add a subdivision surface modifier to the shape, and/or a bevel modifier to produce different effects. Once ready, the modifiers will be left intact if you want to do further editing to the shape. Compatible with my other addons such as the Plating Generator, Bevelled Extrude and Window Generator, as well as other add-ons such as DECALMachine. If you have a new feature request or any questions, either contact me via the Blender Market website or you can reach me on Twitter. You can now add, edit and save lots of preset configurations for different shapes. I have included a small set of example configurations in a separate zip file - see the documentation on how to install them. 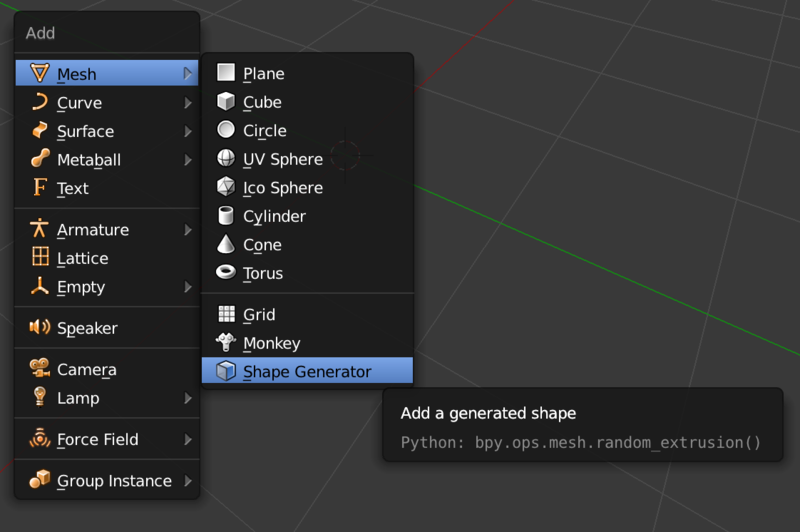 Search for the add-on by typing "Shape Generator" in the search box if it does not already appear. 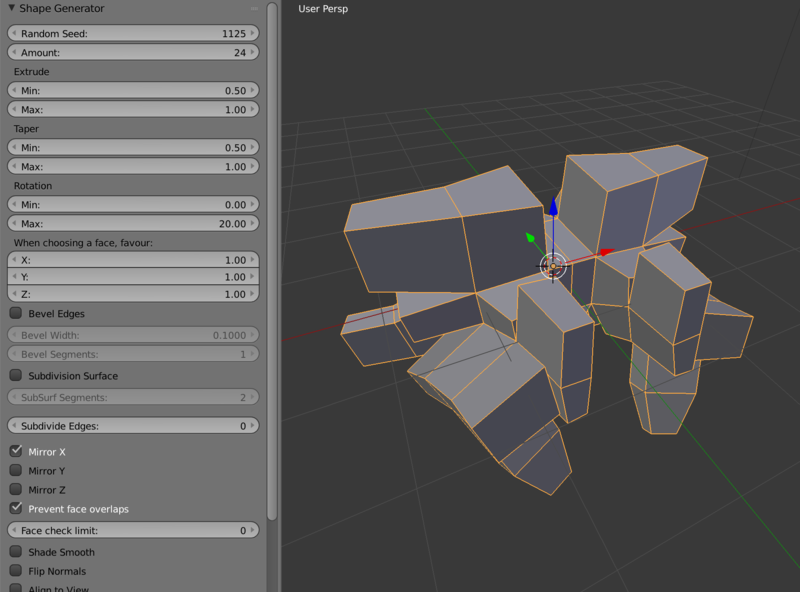 Make sure the checkbox next to the Add-on (Add Mesh: Random 3D Shape Generator) is ticked. Once there you should see folder(s) corresponding to the version(s) you currently have, for instance the 2.79 folder. 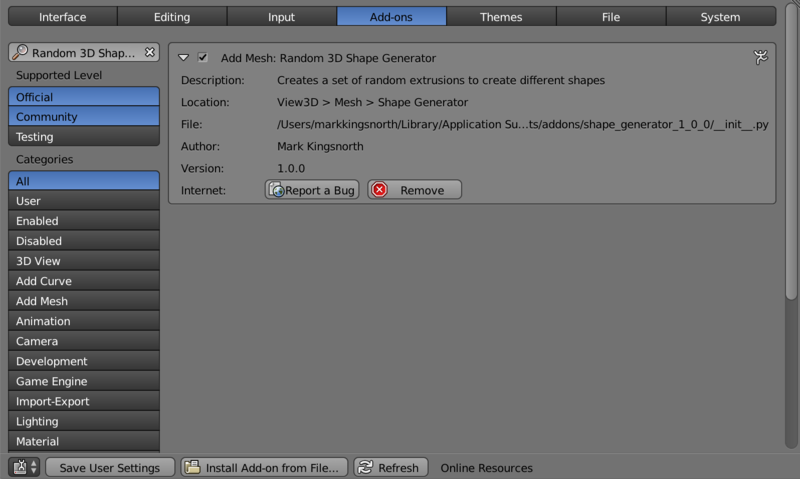 Within that folder, go to scripts/presets/operator/ and create the folder mesh.shape_generator. Unzip the contents of the .zip file to that location. Note that the faces do not overlap and organically grow out. The options in the toolbar are described in the next section. Operator Presets: You can load, edit or save a selection of pre-prepared configurations. Press the '+' and '-' keys to add or delete entries. Random Seed: Different random shapes will be created by changing this value to another number. Amount: This controls the number of extrusions that are performed to to create the shape. This higher the number, the more extrusions occur. The user interface will stop the mouse dragging beyond 100, however you can enter higher numbers by clicking on the control and entering it via the keyboard. Extrude: This provides the minimum and maximum values that the random extrusions in the shape will be restricted by. Taper: This provides the minimum and maximum values that each new extruded edge is shrunk or grown by. A value of 1.0 will keep the face the same as it was before it was extruded; smaller values will shrink the face and higher values will make the face bigger than it was before. Rotation: Control how much a face is bent when it is extruded. This can create more varied shapes. The X, Y, and Z options here put some control over which faces are chosen as the add-on extrudes the shape. By default, all faces in any direction have an equal chance of being selected (1.0, 1.0, 1.0). 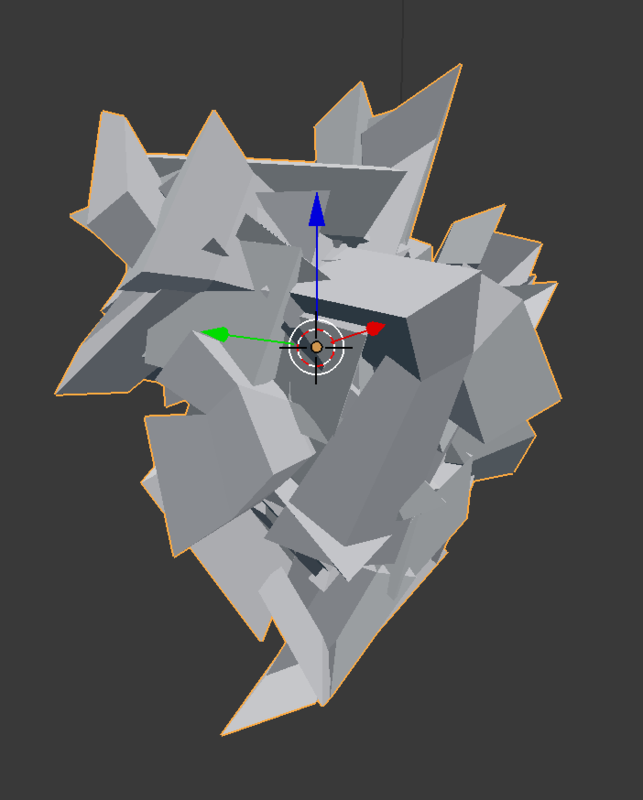 If you decrease the Z value to zero, the faces that will be extruded are a lot less likely to be in the Z direction. 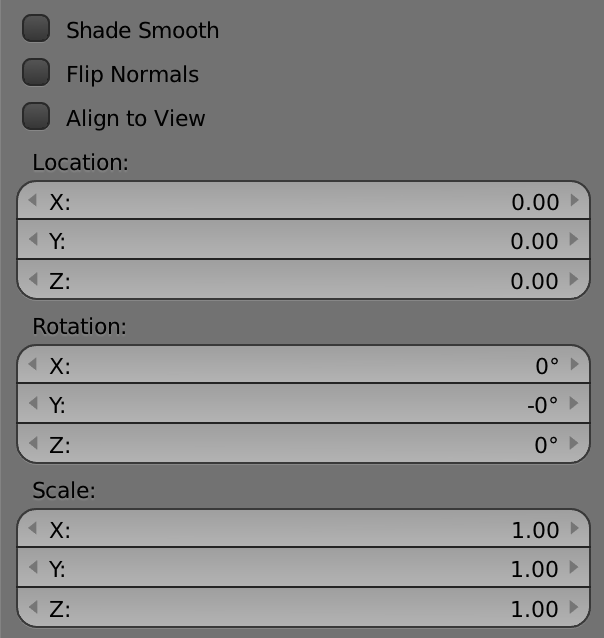 Note that changing these settings does not guarantee that, for example, a face pointing in the Z axis will never be selected; it just reduces the chances significantly. Bevel Width: the width of the overall bevel on the edges. Note that if the shape is complex ith many concave edges, the width will be limited. Bevel Segments: the number of segments in a bevelled edge. The more segments, the smoother the bevel effect. Bevel Profile: The shape of the bevel, from concave to convex. It has no effect if Segments is less than 2. Width Method: Declares how Width will be interpreted to determine the amount of bevel. See the documentation for this under Bevel Modifier. SubSurf Segments: the number of intermediary segments the mesh will divide the surface into. 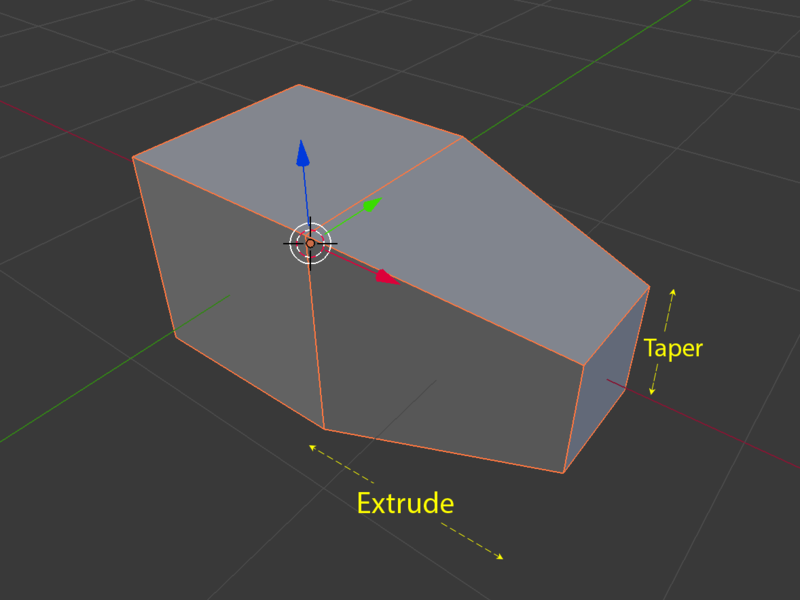 You can choose to add a mirror mirror modifier to the shape in the X, Y or Z axes. This will also bisect the shape along the selected axis. By default, the shape is mirrored in the X axis. 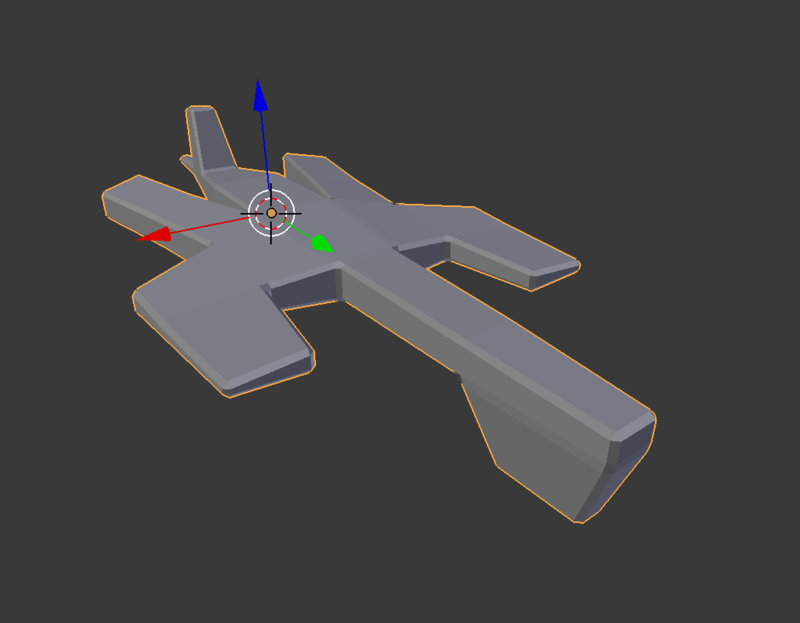 This is good for creating uniform shapes like vehicles or spaceships. A good tip if the mirror modifier mirrors the side you don't want: in the scale settings, described next, set the appropriate axis to -1.0. 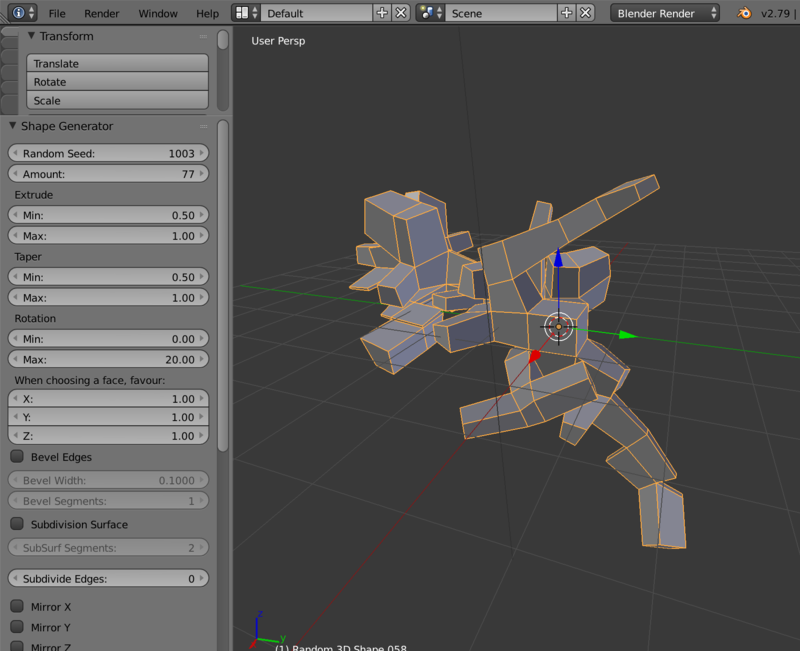 Then select Flip Normals, also described later. Face Check Limit: For performance purposes, you can limit the number of checks the tool will do on other faces every time it does an extrude. Low numbers may still create good meshes without the thorough checks. Zero will mean the check will check the whole mesh (this is the default). Shade Smooth: mark the faces to smooth shading when they are created. 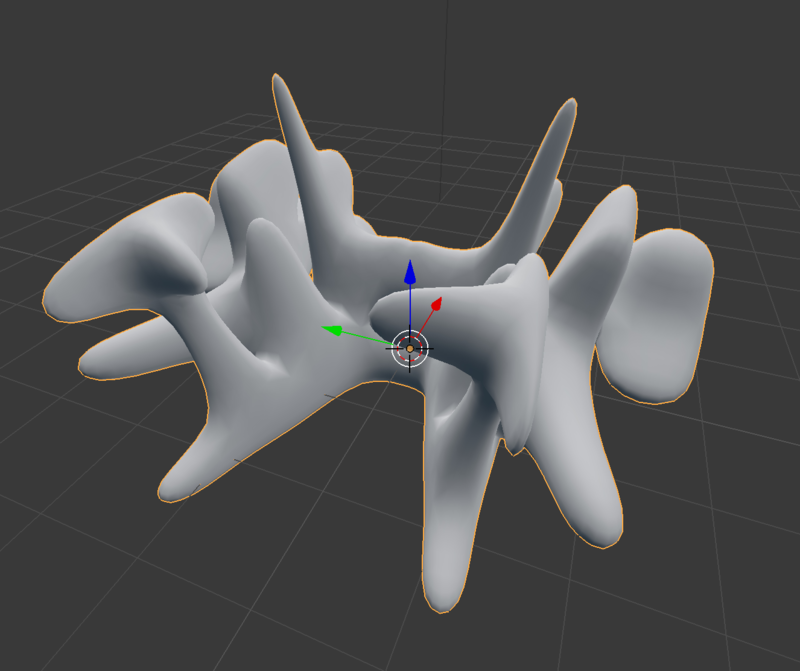 Flip Normals: The normals on the faces of the mesh will be flipped. Align to view: Align the mesh to the viewport. Location: The location of the mesh. Set Extrude Min and Max settings both to 1.0. Set Taper Min and Max settings both to 1.0. Increase Amount to approximately 20. Set Rotation Min/Max both to 0. Ensure Mirror X is selected. 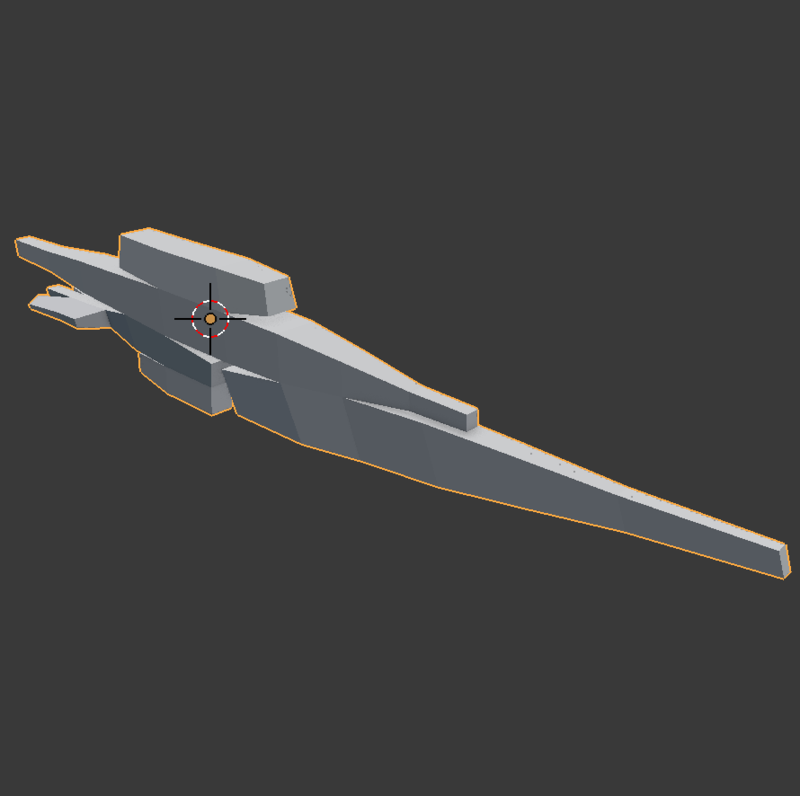 Set Scale to X: 1.0, Y: 2.0, Z: 1.0 to stretch the shape out. 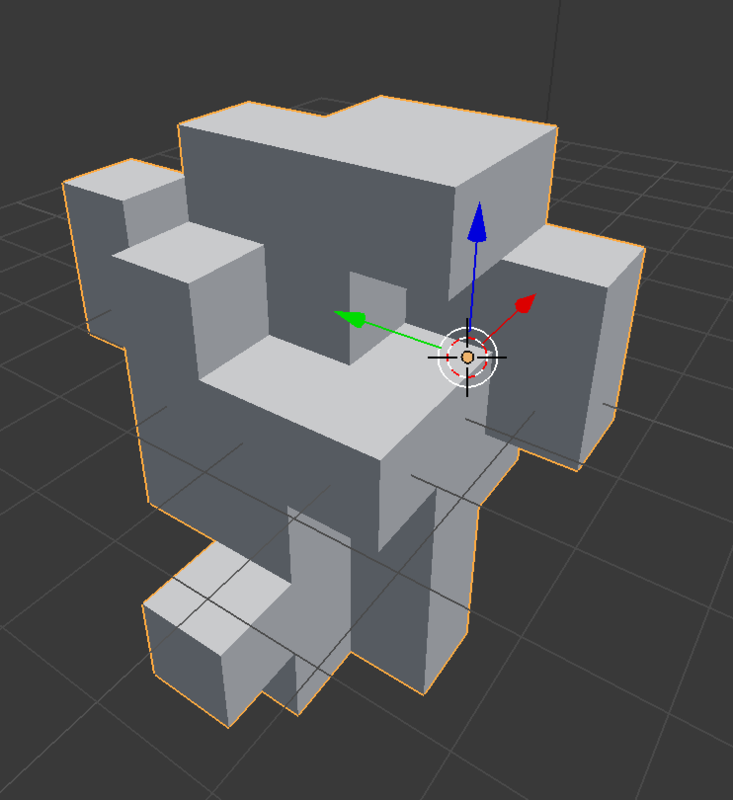 Also set Subdivide Edges to 2 so that uou automatically have extra faces to add details to when you go into Edit Mode. 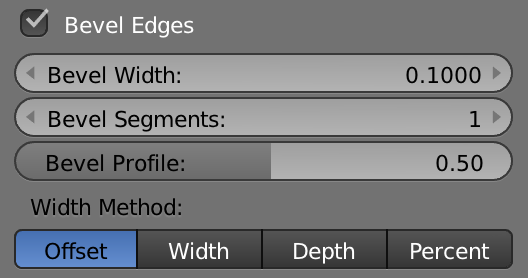 Check the Bevel Edges option. 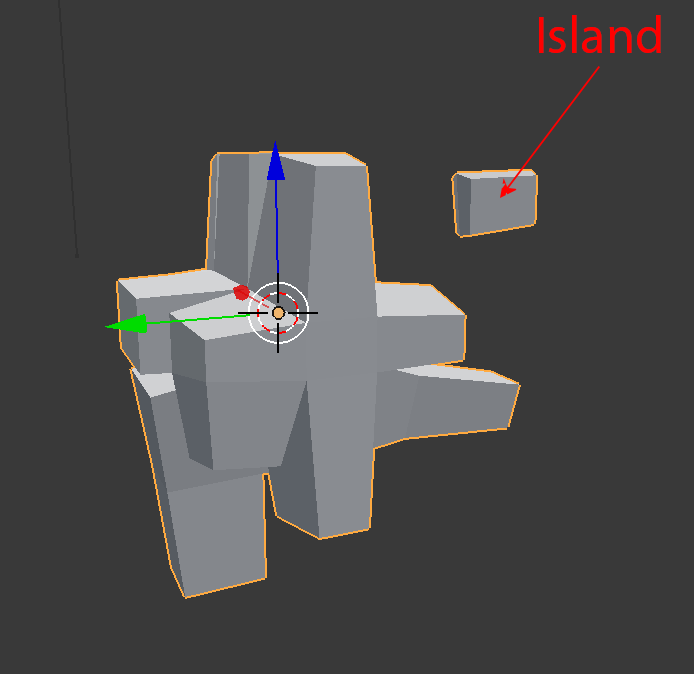 If this occurs and you don't want that island, simply delete it in edit mode once you are happy with the rest of the shape. When I increase the amount, I cannot drag the number beyond 100. Can I increase that number? 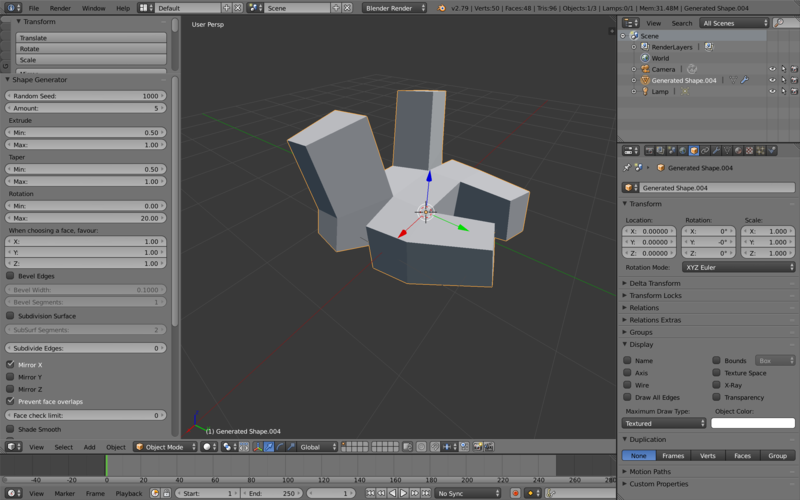 Yes - Even though the user interface will stop the mouse dragging beyond 100 to prevent accidentally creating too many extrusions which may slow down Blender too much, you can enter higher numbers by clicking on the control and entering it via the keyboard. Beware though - the add-on will begin to slow down. If you are finding the add-on too slow at high extrusions, try disabling Prevent face overlaps. This will create shapes with overlapping faces, but they will be quicker to create. Is this add-on compatible with others? 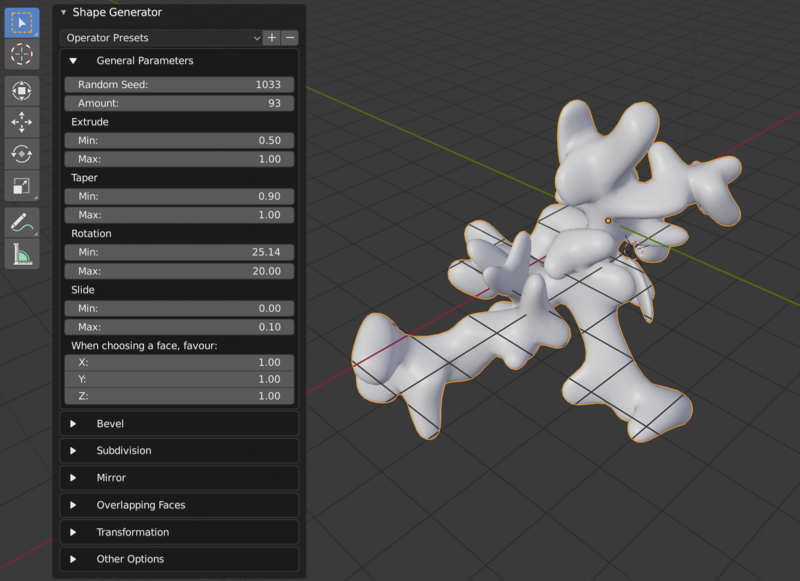 The add-on creates a standard Blender object and so can be used with other mesh add-ons like DECALMachine or my own Plating Generator, Bevelled Extrude and Window Generator. When I generate a shape, there are sometimes orphaned shapes that appear on their own. 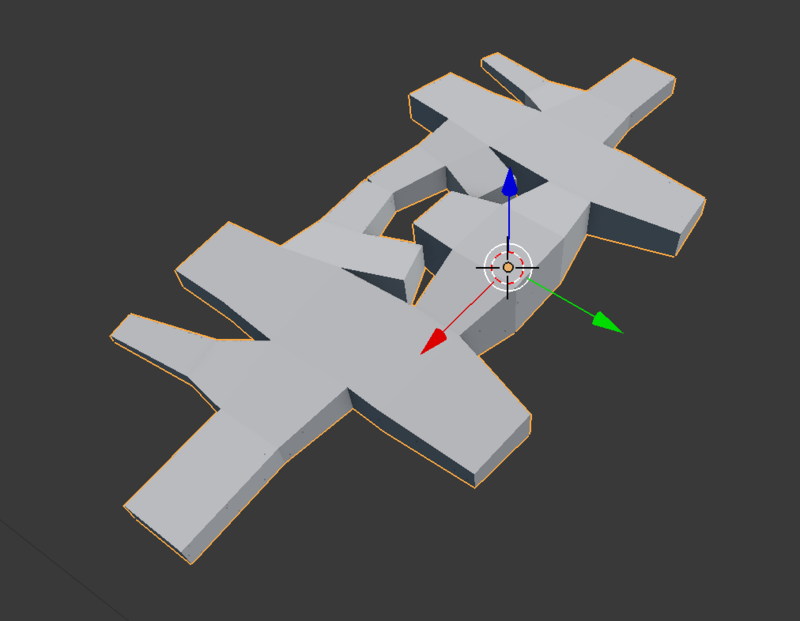 This happens when one of the mirror options is selected, because the object is mirrored after it is generated which can cause the mirror line to create 'Islands'. I have added a note in the documentation which gives further explanation. What was your motivation for the Add-On? I wanted something where I could quickly create sci-fi models which are abstract in nature. I was inspired by the excellent Spaceship Generator Python script which is freely available on GitHub. I wanted something that was not only an add-on that I could configure but also something that was flexible and generic, so that I could create a variety of shapes. Nice tool! I'm making a full game based on it. Got a little question, maybe im just stupid but I want to ask.. When I want to create Color ID Maps to work with Substance Painter, I select faces I want to paint on and when I try to give these faces the same ID the whole mesh is turning into that ID Color. Any idea how to fix this or how to get it to work? Would be really nice. Thanks for the praise Jan! I just tried to make a Color ID map in Blender and it seemed ok - send me a message via the "Contact the Creator" section describing the problem with some screenshots if you can, and I'll either update the FAQ or add a bug fix.